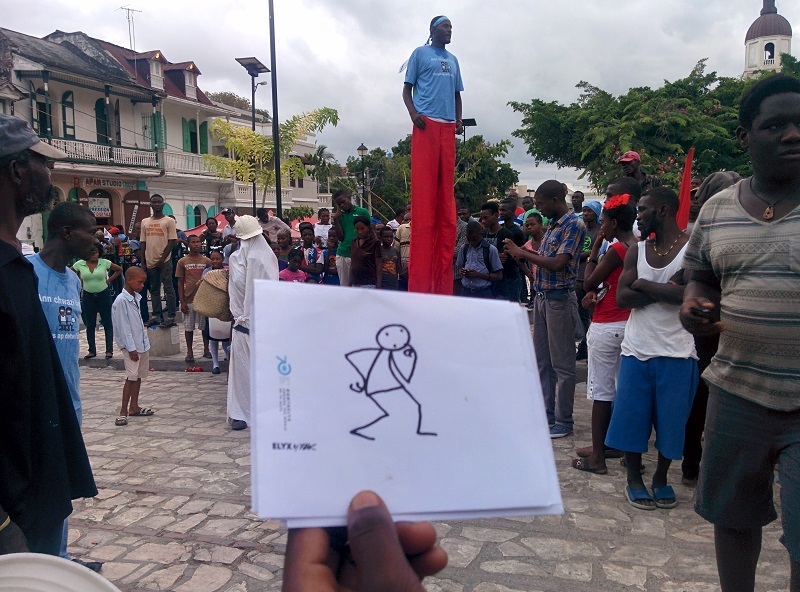 Haiti: Elyx gets to know the culture and the people of Haiti! Today Elyx is ready to explore the Republic of Haiti, where the UN staff has awaited our digital ambassador’s visit in their country. Haiti is a unique country sharing the Island of Hispaniola with the Dominican Republic, in the beautiful Caribbean. However, through the last few years, Haiti has gone through challenges. Indeed, Elyx remembers hurricanes and tropical storms that hit the country from the 2004 till 2008 and the tragic earthquake in 2010, but also the cholera outbreak in 2010. Due to the following humanitarian needs, Haiti has welcomed an extensive UN presence in its territory. The MINUSTAH, the United Nations Stabilization Mission in Haiti was implemented to assist Haiti’s provisional government after the resignation of Aristide as President of Haiti in 2004 to support a peaceful and constitutional solution to the crisis. 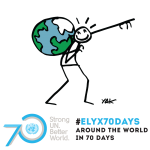 Elyx learned that it is the main UN body and works closely with the UN Country Team, composed of 18 UN agencies and programs. While as a peacekeeping Mission MINUSTAH supported the Haitian institution in drastically improving the security and rule of law, they also coordinates their actions with the UN family in Haiti through a joint UN integrated framework (ISF), for a long term development agenda. The MINUSTAH staff invited Elyx to visit Haiti to show it special events and programs, but also the natural beauties of the country. During the morning, Elyx walked with some representatives of MINUSTAH to visit the city center and after a while Elyx’s attention was caught by a very loud and joyful music. Our digital ambassador looked on as vibrant ‘rara’ or marching bands made their way through the streets! Elyx was really impressed as over 1,000 revelers of 5 different rara bands marched across the city to join the peace concert in Cap-Haitian. 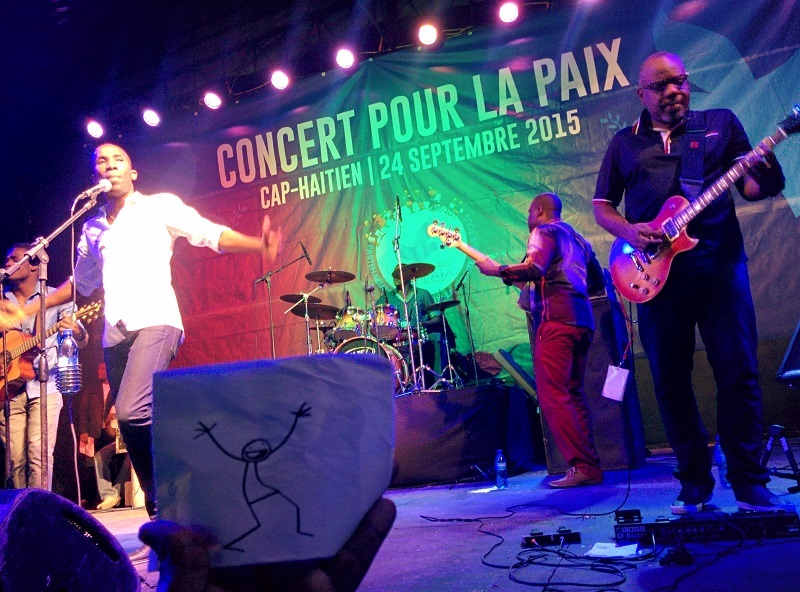 Following the marching band, Elyx participated to the peace concert in Cap-Haitian and our digital ambassador had a lot of fun, singing along to the music of renowned Haitian artist BelO (@atisBelO). On this occasion, the human rights advocate BelO reminded a crowd of 1,600 about the necessity to engage themselves within their respective communities, because peace matters to everybody. Elyx was so happy for the amazing night! But there were other things to see and to learn, so before continuing the visit, Elyx decided to take a small well-deserved break in the mountains high above Port-au-Prince. 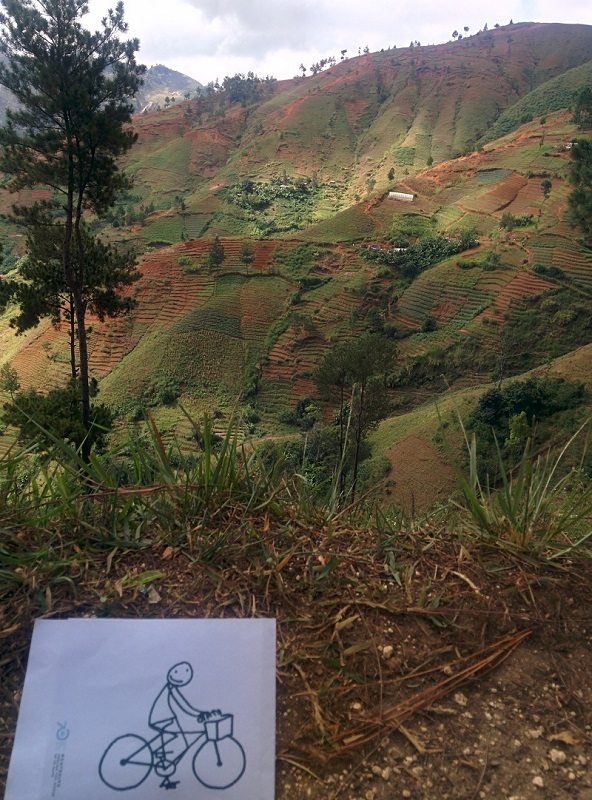 While admiring the beauty of the countryside, Elyx learned that Haiti has the highest deforestation rate in the world. According to UNDP, only 2.6% of the land is forested, as most of it cleared for small-scale farming and charcoal production, leaving Haiti disaster-prone and vulnerable to climate change. 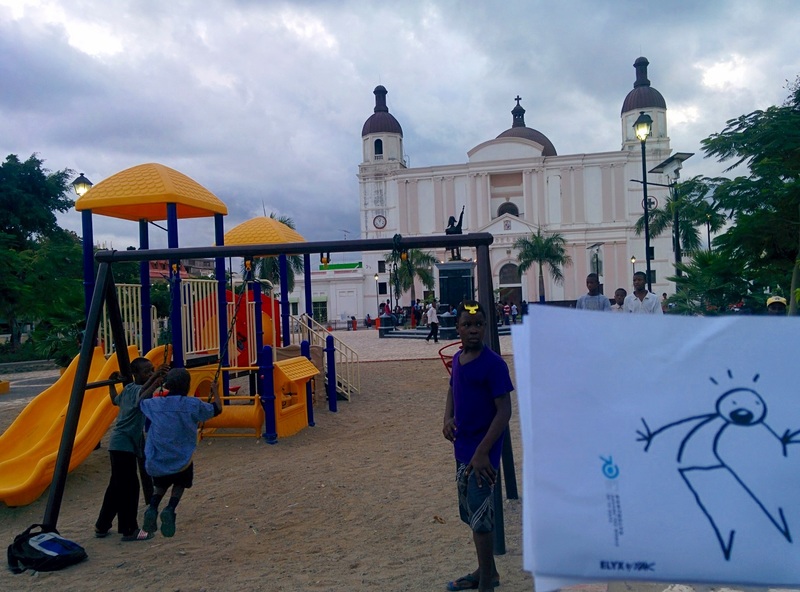 Finally, Elyx could not leave the country without first saying goodbye to the children of Haiti. 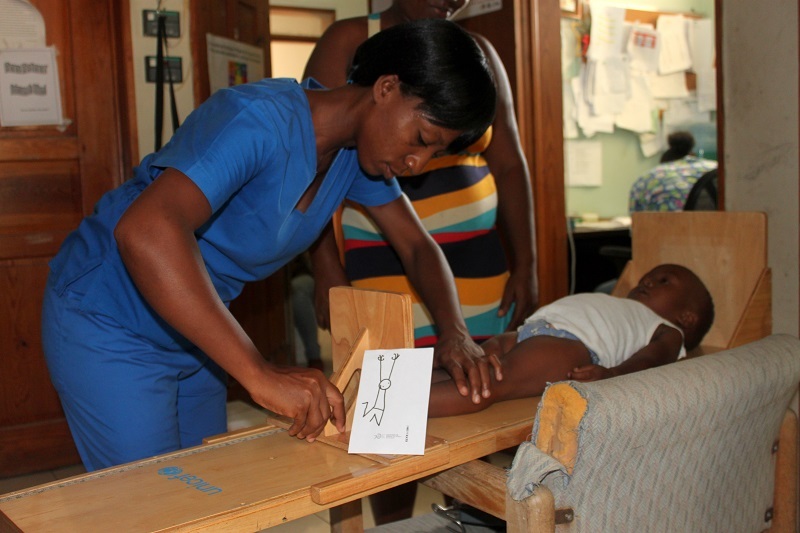 So, the UNICEF staff invited Elyx to visit the St. Boniface hospital where doctors and nurses constantly monitor and control the healthy development of children. The UNICEF has done extensive work in Haiti, especially in assuring and promoting the child and maternal health and nutrition. Elyx was glad to see such a commitment, thinking that it is a promising start for the fulfillment of SDG number 3. It has been an incredible journey and Elyx is ready to travel again, au revoir Haiti!